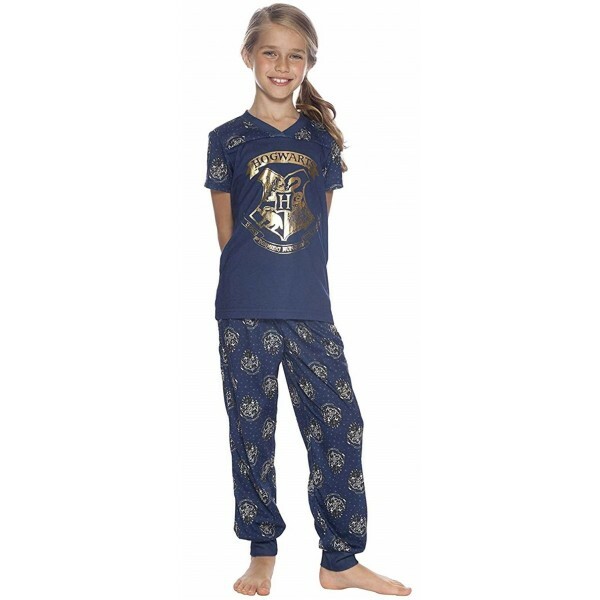 Dream of getting your Hogwarts letter in this cozy pair of officially licensed jogger pajamas! These comfortable 100% polyestery pajamas feature a foil Hogwarts crest on the top, and an all-over print of crests and stars on the sleeves and jogger-style pants, all against a dark blue background. The jogger-style bottoms make them extra comfortable for a good night's sleep or a quiet day lounging with a book. Available in sizes 4-5 and 6-6X. For more products for fans of the Harry Potter universe and its empowering female characters, visit our Hermione Granger Collection.